The bond between a mother and child is a special and everlasting relationship. 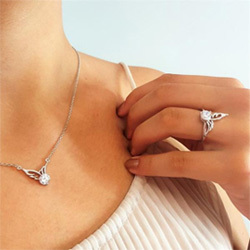 This elegant and meaningful necklace is adorned with a captivating angel wing scattered with gleaming lilac crystals in and a dainty rose charm. The saying on the angel wing holds a heartfelt sentiment “Heaven’s garden grows a flower for every time I think of you,” a tribute to all the wonderful moments spent together, and the depth of your unbreakable bond. This wonderful piece is a perfect memento to keep memories of your loved one always blooming and hold them close to your heart forever. Had a problem with the back of my piece and contacted the company and it was replaced immediatly. They really stand behind their product. I have to have it on every day. Lost a son very tragically and I wear it for him. We have had a lot of loss in the family over the past couple of years. These will be christmas gifts for some very special ladies in my life. Love the design and I'll wear it it remeberence of my husband. I bought this for my mother for mother’s day and she loves it the design was way better then I expected and when i had an issue with tracking they addressed it right away really recommended!!! I love this necklace and I'm buying more for my sisters and mom. The only issue I have with this is how easily it gets fingerprints all over. Other then that we all love them. I got ten for the ten women closest to my step sister when she passed away suddenly. Everyone is obsessed and in love! My mom loved this in memory of the two daughters she has lost. I was impressed with the quality of the pendant. We plan to order another for her friend who lost her son. I lost my heart dog in Jan 2017 to intestinal cancer - it devastated me. When I saw this necklace, it said what my heart was feeling at the time. It's well made and just the right length. The heart is a very nice touch as well. The only concern I have is that it scratches quickly, so it's starting to look bad. I love it, i bought 3 one for me and one for each of my daughters! I havent taken it off since i got it! I love this beautiful necklace. Every time I feel it around my neck I think of my dad! It is absolutely my favorite necklace! I love the necklace! Exactly what I thought it would look like when I ordered it. Thank you for this necklace. When I opened the package, I was amazed at the size of the feather and that you could read the writing on it. The writing is well done and beautiful. Of course, opening the package also made me cry. I purchased this partly because of the people in my life who have gone on before me but mostly for the sweetest pup in the world, that I lost in January. He was only 6 yrs old and was struck down by intestinal cancer. He was gone in 3 days and took a large part of my heart with him. The saying on the necklace is what I think every day. I absolutely Love it! It’s beautiful! I bought this necklace in remembrance of my Mother and it’s absolutely beautiful! Just what I wanted! there was a little bit of confusion with my order but, it was handled professionally and promptly. the product is very pretty. I would recommend you without hesitation. This necklace means so much to me. I plan on having it ingraved. Thank you so much! It’s beautiful! I ordered. 2 of these 1 for my sister who just lost her youngest son and 1 for myself. They are truly amazing looking. I'm currently having them ingraved i can't wait to pick them up. All your jewelry is beautiful i wll most definitely order another piece. Bought it as a gift, for her mother's passing n she loved it n cried. Extremely pleased with my purchase and shared it with friends. After losing my husband , this was a perfect expression of my thoughts. Absolutely beautiful. Was very happy with the necklaces. Giving them as gift to three granddaughters in memory of their maternal grandmother. Plan to order soon a ring for myself and another necklace for my niece. It would be nice to have the writing on my both sides so it it gets twisted, you can still see the writing. It’s a beautiful piece but the writing is smaller than I expected, other than that it’s beautiful. It was a gift for my daughter and she loves it. I've recently purchased a few item, and am extremely satisfied. I've also gotten many great compliments, too. The quality is really good. I love it!! I love all my items from this order. Sayings are so close to my feelings during this difficult time. Just what the wife wanted with the perfect saying love it & giving to our daughters!!! The necklace is absolutely beautiful. I am very happy with my purchase. The product came faster than expected and it was so beautiful! I wear it every day in remembrance of my mom. I will definitely order from Linda’s Angels again! This necklace is absolutely beautiful...I do wish the chain was maybe an inch or two longer though. It is my favorite Christmas gift to myself! It's a bit larger than I expected but I LOVE it -- it's beautiful for sure. I put it on a different chain since I had one that I do love and fits in better with the 2 other necklaces that I wear with this one -- all are in memory of my late husband. As with anything I have bought from Lindastars the quality is very good and the design is beautiful. It's perfect and made my day when I received it. I ordered 3 necklaces & 1 ring. They were so good I ordered 4 more necklaces. They however have not shipped yet. I suppose they are extra busy for Christmas, just hope they arrive before Christmas. Very nice items, and I received them in a very timely manner. I want to thank you all for having such amazing customer service. This necklace is absolutely beautiful! The chain is exactly the right length and the pendant is as perfect as the pictures in your catalog! I love this necklace and will wear it every day. This necklace is so beautiful! It's my way of honoring my son and it couldn't be more perfect. Thank you for a quality product and really fast shipping! I get so many compliments on this beautiful necklace! It seems to bring joy to those who see it - and hope. I just love it. So beautiful and shiny. Wear it all the time. I ordered this for a friend who lost her oldest child a couple of years ago. I haven't seen her yet to give it to her. I lost my husband in Jan., and I bought my three daughters and myself this necklace, We all love it because of the message. We miss him so much, but we have all the beautiful memories. I love it. It's just beautiful and the saying is so true. Lost my husband of 36 years about a month ago and the saying says it all. Was as expected. Was a wonderful tribute to my husband. I gave it to my Mom because my Dad passed away 3 years ago. She loved it, saying it was exactly how she felt, (which is why I chose it!). I love it. It is easy to read. Made me sad and happy at the same time. I bought it in memory of my husband who passed away 5 years ago from Parkinsons. Love the quality and detail. Length is really generous and I haven’t taken it off. Looking forward to adding another piece to my new collection in honor of my two girls I had to give back to God. Beautiful, thank you for the fast shipping as well. I purchased the necklace for my sister for her Birthday. Her son passed away a year and a half ago and it has been difficult. The necklace brought her such joy with smiles and tears. I was very happy with my purchase. fast shipping, bought it as a gift and they loved it . Purchased as a gift for a friend going through a hard time after a family loss. She loves it and the sentiment was perfect! I lost my Grandson on Oct. 6Th 2012 and this year would of been his golden B-day so I got it for my Daughter-in-law and she loves it. I will be buying more items and the money comes in for I am on a fixed income. I've told a few Friends and hope they buy from you. I lost my husband on May 2nd. I was looking for something to complete my feeling of his loss. This has filled that one missing piece. I truly love it. Both of my parents have passed over the last couple of years, and when I saw this necklace it was perfect, because when think of them I smile and cry. Love it. I bought this for my Daughter-laws Mother who just lost her son. I hoped it would help as several years ago I had also lost my son. I hoped it would help a little. Loved it and glad I ordered!! Everybody has fallen in love with it...thank you. It's been a year & a half since I lost my baby girl...this necklace simply said it all because "Not a day goes by"...thank you for giving me something tangible to touch that allows me to "smile or cry or both". It's beautiful.